Cancers of the kidney may be referred to by many names, renal cell carcinoma (RCC), hypernephroma, Grawitz’s tumour and clear cell carcinoma. They make up 85% of all renal malignancies. Incidence continues to increase due to improvements in and increased access to Ultrasound and CT scanning. They are more common in men than in women by a ratio of 2:1. The commonest age to present with the disease is between 60 and 80. People with a rare genetic condition called von Hippel Lindau disease develop tumours at an early age. The classical triad of a mass, pain and visible blood in the urine is now rarely seen, less than 10% of patients present this way. The majority are diagnosed incidentally during imaging for another condition, resulting in a less advanced cancer at diagnosis. In symptomatic RCC haematuria (50%) is the commonest symptom, 25% have symptoms of disease spread such as weight loss, night sweats, fever and fatigue. Lower limb swelling and acute left varicocoele occur secondary to venous obstruction. 10-40% of patients suffer from a paraneoplastic syndrome due to the ectopic secretion of hormones. Conventional (70-80%), also known as clear cell due to the pathology process that removes the fat from the cells resulting in characteristic appearance. Collecting duct rare, poor prognosis, young patients. Medulary cell rare, young, Afro-Caribbean, sickle cell disease, poor prognosis. The majority of kidney cancers are treated with surgery. Laproscopic (Key Hole) renal surgery is usually possible, but open radical nephrectomy (kidney removal)remains necessary in a number of cases. Treatment is dictated by a number of factors including age, other health problems, size of the tumour, number of tumours and the condition of the other kidney. Kidney sparing surgery (Partial Nephrectomy) or treatment is the preferred option, if appropriate. Tumours not amenable to partial nephrectomy, with a normal contralateral kidney may be treated with a laparoscopic radical nephrectomy or open radical nephrectomy if not suitable for key hole surgery. Small tumours may be removed from the kidney . Partial nephrectomy can be performed with a key hole technique but may require open surgery. Other options for small and occasionally multiple tumours, include cryotherapy (freezing of tumour) and radio frequency ablation (heating of tumour). Often small incidentally found lesions in the elderly, may only require treatment if they become symptomatic. Blood in the urine can be dealt with by blocking the blood supply of the tumour, this is performed by radiologists. Cancer spread is usually managed by the oncologists, single areas of spread may be resected from the relevant organ if possible, this includes brain disease. If chemotherapy is planned, oncologists often request the removal of the kidney to reduce tumour load. Immunotherapy with interferon alpha and interlukins was the commonest treatment. Newer tyrosine kinase inhibitors such as Sunitinib and Sorafenib are now being used clinically. Renal cysts are present in >50% of the population over the age of 50, this was unknown until the advent of widespread renal tract USS. Simple cysts make up 70% of the benign renal masses and seldom require treatment. Solid benign masses include oncocytomas and angiomyolipomas (AML). Oncocytomas are difficult to distinguish from malignant tumours and are therefore usually removed, if found no follow up is required. AML occur sporadically but 20% are associated with tuberosclerosis, a rare genetic condition. They are composed of blood vessels, smooth muscle and fat. 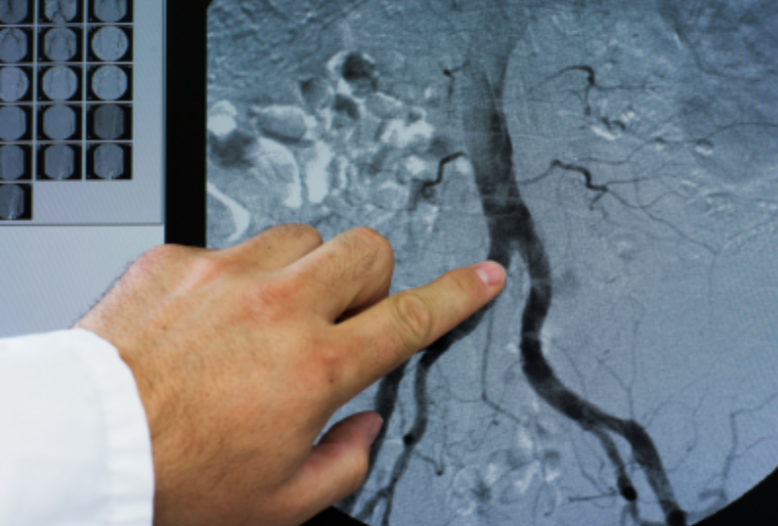 When they become greater than 4cm, due to the risk of haemorrhage, treatment is usually recommended with either embolization or resection.